Wittenborg was established on the 21st September 1987 in Deventer, The Netherlands. In the Netherlands there is a two-tier system of traditional “old” universities and polytechnics (HBO), known in English as Universities of Professional Education, comparable to the UK system before changes that led to “university status” for all institutions. Since 2002, a new system has been introduced which paves the way to a harmonising of this two-tier structure. Also, there is a division between higher education institutions in the way that they are funded: by the government, both “old” and “new” universities can be state funded, and state-independent institutions. Wittenborg is an Independent State University of Applied Sciences (aangewezen). This means that although its students receive government funds, the institution does not. 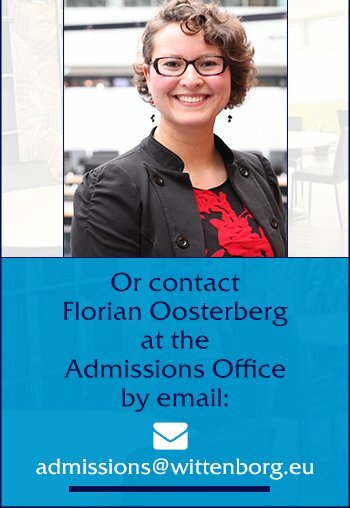 Universities such as Wittenborg are required by law to follow the stringent accreditation procedures as described below. Until 2008, Hogescholen were known officially as Universities of Professional Education. In July 2008 this was changed to Universities of Applied Sciences. 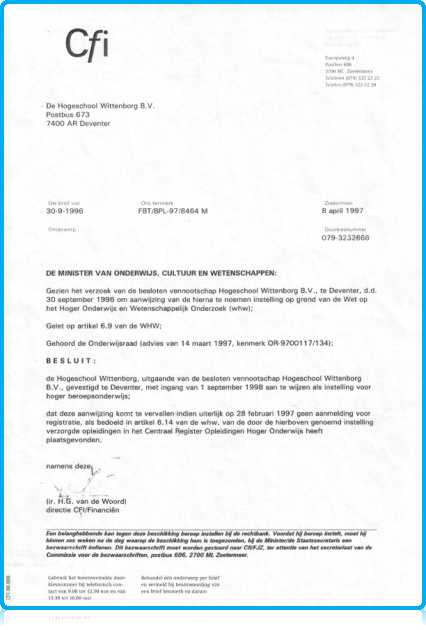 Below, there is a copy of Wittenborg’s certification as an Independent State University of Professional Education (Aangewezen Hogeschool) from the CFI, the administrative department of the Ministry of Education. Wittenborg’s degrees are recognised in every country that recognises the Dutch Ministry of Education’s accreditation and degree structure. In October 2010, a change in the law implied that in essence Wittenborg’s “Dutch” status changed from a “Hogeschool” to an “Entity for Higher Education”. This led to the official name being changed from Hogeschool Wittenborg to Wittenborg University of Applied Sciences.